How to get there: From Nordfjordeid, drive towards Volda (north-east) on E-39 for about 3 km, turn right on Hwy. 15 towards Hornindal. Follow this road approximately 1.5 km and turn left onto a smaller road leading to Austefjord. This road runs on the north side of lake Hornindalsvatnet. After about 10 km, look for a sign that says Volda, going sharply to the left. This turn may be easy to miss, the turn is while going downhill and well before the road gets back down to lake Hornindalsvatnet. Follow this road as it gains the saddle and starts descending, you will have the lake Grøndalsvatnet on your left as you locate a small, toll road that runs left just after crossing the river from Grøndalsvatnet. Park here, unless the road is free from snow, in which case you may drive a bit more than one kilometer to Grøndalsstøylen. Route description: Hike along the lake (on the road) to Grøndalsstøylen (460m). From here, you should see three valleys, Bygdaskardet is all the way to the right, that is, just north of you. There is a well defined trail starting just beyond the grass on the north side of the houses. Follow this trail as it winds its way through the birch forest and climbs more steeply to Fantekrålvatnet (802m). This lake is near the saddle, a larger lake, Skardevatnet (818m) to the north-west, drains north. Just after passing Fantekrålvatnet, the route turns left and climbs the large, but not very steep mountainslope above you. Continue up this slope until it levels off, the best route is to go a bit left (west) of what appears to be the highest point. Gradually, the steeper, south facing cliffs of Eidskyrkja will be visible to your left. Continue the gradual climb to the summit in a wide arc, first north, then gradually more west until you arrive at the huge summit cairn. Comments: I made this climb with my son Pål Jørgen, age 14, and my friend Jan-Frode Myklebust. This is a near perfect mountain to ski. The main slope is quite big and wide with a nice angle. We had new snow on the upper part. Several people arrived from the north and we all enjoyed the great scenery from this prominent peak. Eidskyrkja, as seen from the road next to Grøndalsvatnet. Eidskyrkja as seen from Matøskja in January 2009. Panorama view of Sunnmøre from the summit of Eidskyrkja. 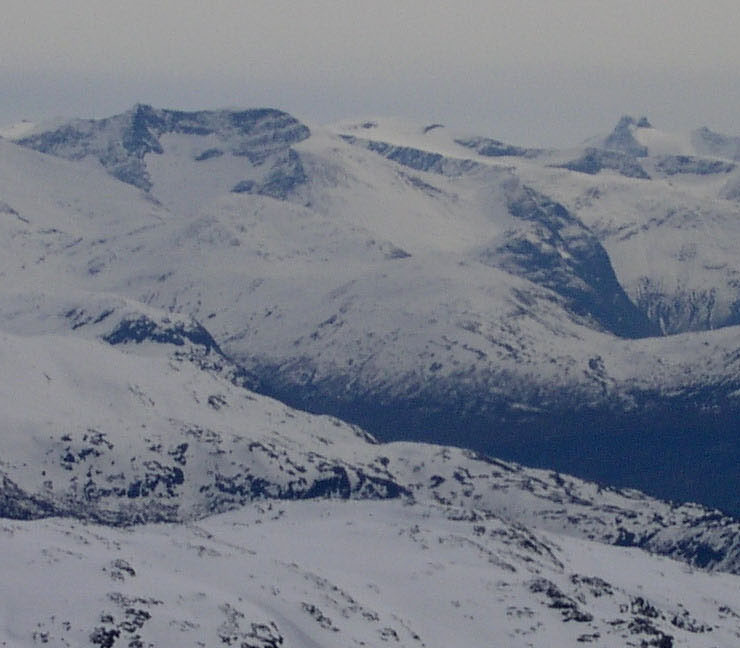 Panorama view north-west Store-Toren (1215m), the very characteristic Lissje-Toren (1164m), Klakken (1256m) and Felden (1272m), then Bytingstinden (1260m) and Trollvasstinden (1285m) further to the right. 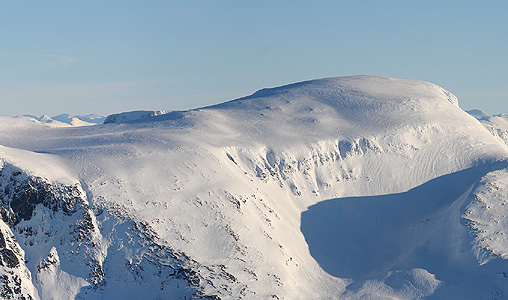 Skåla (left) and Lodalskåpa (right) as seen from Eidskyrkja. Kåpa looks almost like a twin peak from this perspective.